Wood Panel Van Liquor Cabinet: Why Not? 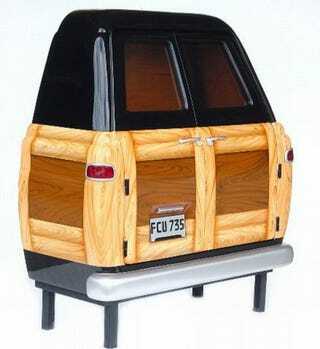 Be prepared to confuse the hell out of guests because it's time to finally get an indoor wood-panel van, or at least a quarter of one. This Wood Panel Bar is a bar/liquor cabinet for lovers of the wood paneling. The liquor cabinet includes a classy drawer, hanging racks for various types of classes and an extending shelf. The back doors swing open like a real wood-panel van and the only downside is the lack of wheels. Click through to see another picture of the cabinet open.